JFL42 returns to Toronto this fall, and the stacked lineup is sure to bring plenty of laughs to Canadian comedy fans. 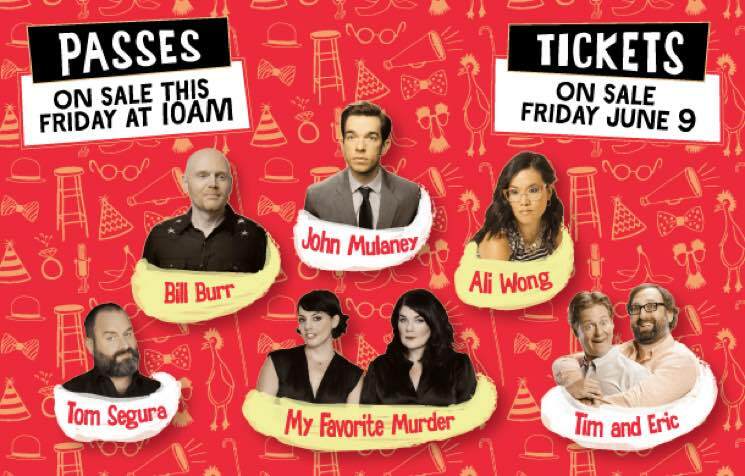 The list of performers has just been revealed, and it is topped by headliners like Bill Burr, John Mulaney, Ali Wong, Tim and Eric, My Favorite Murder, and Tom Segura. Other familiar faces taking stages across the city include Jenny Slate, Jay Pharoah, Janeane Garofalo, Rhys Darby, Brian Posehn, Kyle Kinane, Jen Kirkman, Rory Scovel, Roy Wood Jr., the Lucas Brothers, the Guys We F&%@D podcast, Michelle Wolf, Gina Yashere, Andy Kindler, Mark Normand, Morgan Murphy, the winner of SiriusXM's Top Comic competition. That's not it, though — helping to round out the 42 performer lineup are Rachel Feinstein, Beth Stelling, Liza Treyger, Kevin Camia, Anthony DeVito, Noah Gardenswartz, Ali Saddiq, Sara Hennessey, Mike Rita, Sandra Battaglini, Chris Locke, Sophie Buddle, Che Durena, Chris Robinson, Eman El-Husseini and Soul Decision. Additional performers are expected to be announced in the coming weeks. The sets will take place from September 21 to 30 across venues in Toronto, including Yuk Yuk's, ALTdot Comedy Lounge, Comedy Bar, the Second City, Bad Dog Theatre Company and Absolute Comedy. Festival passes go on sale this Friday (June 2), while tickets for individual shows go on sale next Friday (June 9). You can find full pricing and schedule information over at the official JFL42 website.